A technical competition model. Super lightweight, sticky and aggressive competition shoe. Designed to ensure perfect stability and support on all types of off-road terrain. 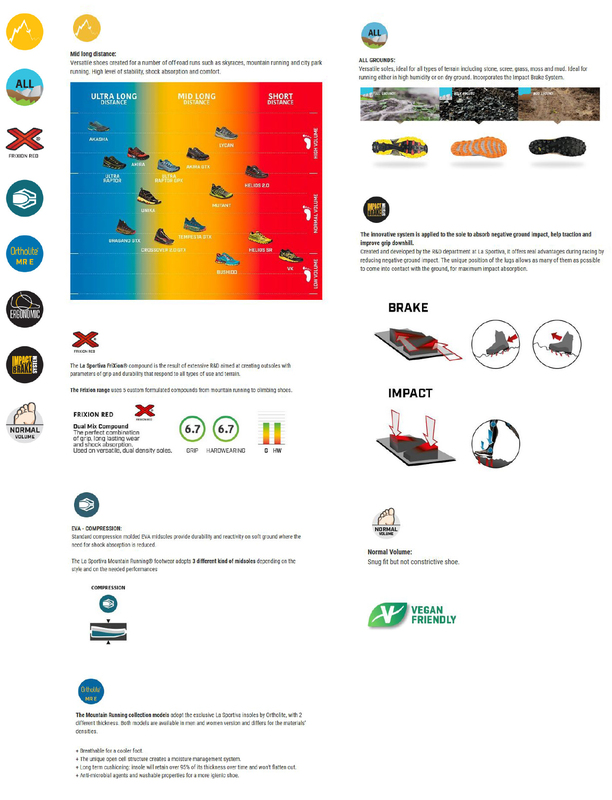 Re-designed toe guard, more breathable mesh in upper, upgraded midsole, more durable arch exterior, perfect stability and support for all types of off-road terrain. State of the art technology and aesthetics in the world of mountain running. Upper: breathable, air mesh with thermoplastic film reinforcements, TPU medial skeleton placed laterally on rip-stop inserts. The Bushido and the Bushido II are more similar than different. The Bushido II retains all of it's winning features as the first-generation, but with some nice tweaks. Changes to the Bushido II are relatively minor. But significant enough to warrant a second-generation designation. The biggest difference is the EVA midsole being more responsive and springier due to the inclusion of proprietary LaSpEVA in addition to the holdover compression molded MEMIex. The exterior arch is covered in a more durable material where previously this was one of the first blow-out points. The upper is made of a more breathable mesh fabric. The toe-guard is redesigned. The rubber (not synthetic leather) has been extended out over the toebax. The small strip of synthetic leather on the lateral perimeter of the toebox has been removed to avoid some complaints about pinching.